Twinsburg, Ohio (CNN) — If you unwittingly pass through this Midwestern town on the first weekend in August, you might think you’ve stumbled into a mirrored funhouse. Everywhere you look there are identical twins, all of them wearing matching outfits. Here, two stout gray-haired men dressed as pilgrims. Over there, a pair of bearded dudes in lederhosen, hoisting trays stacked with mugs of beer. Even the baby girls in the two-seat stroller, sporting Steelers onesies, are spitting images. 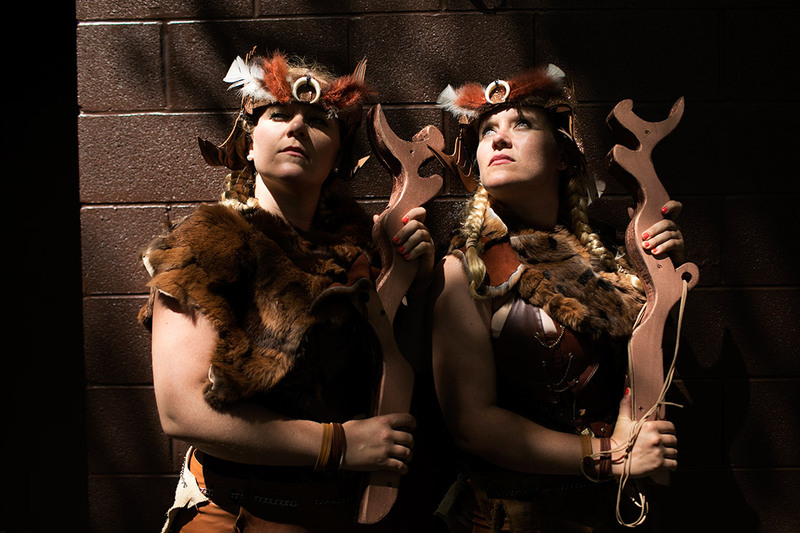 This double-vision spectacle is Twins Days, an annual festival that brings thousands of twins from around the globe to northeastern Ohio to celebrate their twin-ness. 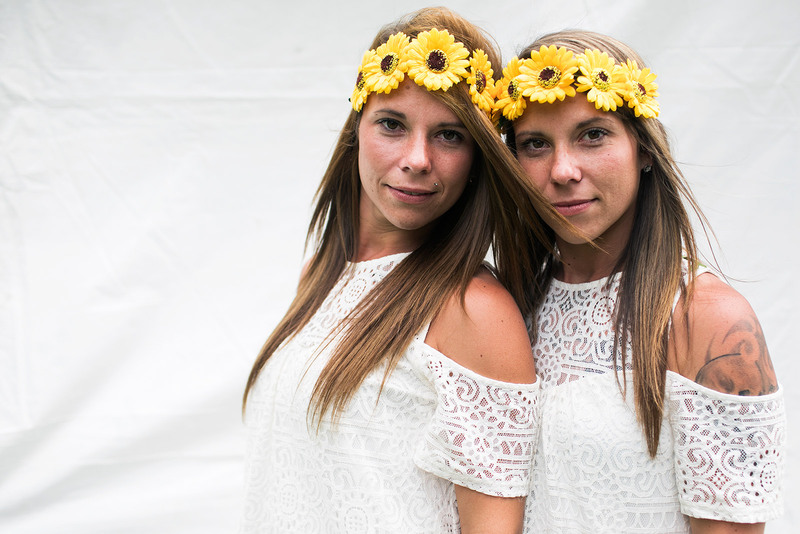 The festival bills itself as the largest annual gathering of twins in the world. It’s also one big petri dish for scientists, who flock to the festival every summer to study twins’ genetics and behavioral differences. “It’s a club you can’t buy your way into,” says Katie Barry, 32, of New York City, who has been coming to Twins Days with her twin sister Kristy every year since they were 7. She gazes around at the carnival of costumed couples with a smile, searching for the right words. It’s almost too perfect that Twins Days is held in Twinsburg. The Cleveland suburb is named for identical twin brothers who helped settle the town and died of the same ailment in 1827, within hours of each other. The festival got off to a quiet start in 1976, when 36 sets of twins showed up. It grew fast. This year, the event attracted more than 1,900 sets of twins, along with a smattering of triplets and at least one set of quadruplets. They come from almost every US state and from as far away as Australia. The event has a county fair feel and includes a parade, look-alike contests, a talent show and an enormous group photo — a human blanket of twins — taken in a field from atop a crane. 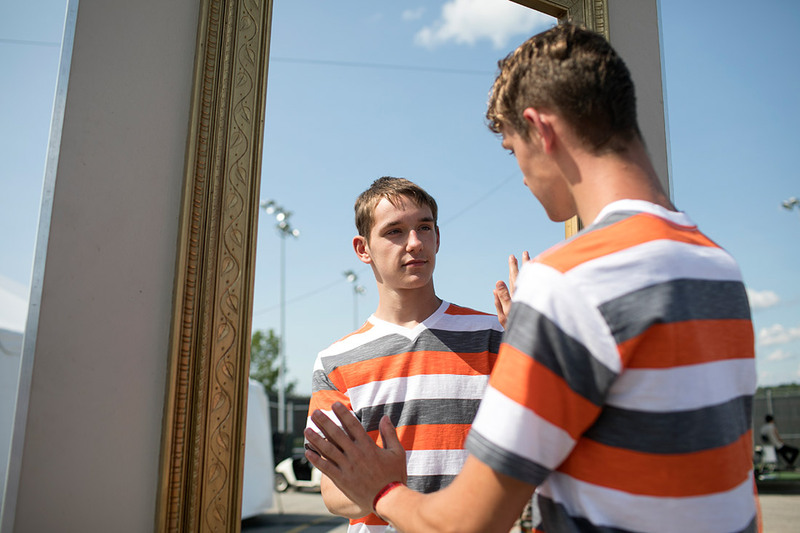 Joshua and Jacob McClelland, 16, pose on opposite sides of a “mirror” at the festival. More than a few have rhyming names, like Bernice and Vernice, Carolyn and Sharolyn and Jeynaeha and Jeyvaeha. For many identical twins, who spend the rest of the year drawing stares and enduring stupid questions — actual example: “Do you have the same birthday?” — it’s a rare chance not to stand out. Twins say they enjoy profound bonds that few “singletons” — as non-twins are called here — fully understand. About 33 in every 1,000 human births in the US are twins, a rate that has climbed in recent decades as more women marry later and take fertility drugs or employ in vitro fertilization. 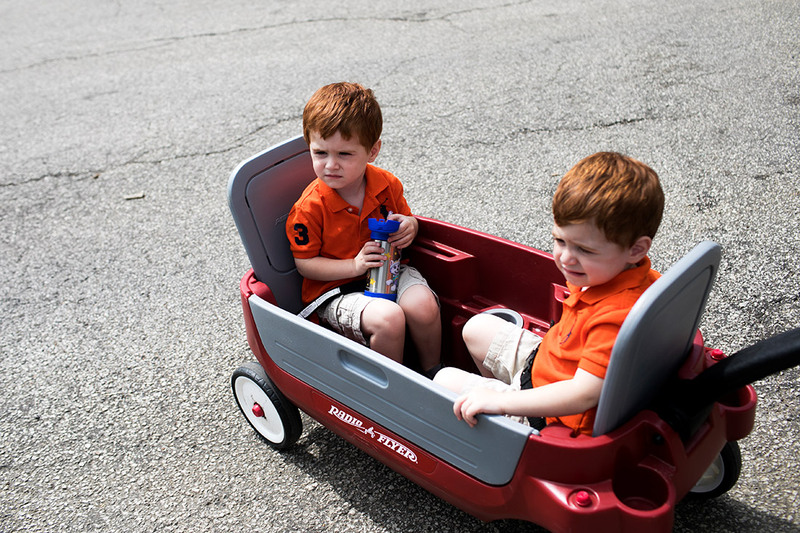 Identical twins are an even more exclusive club — roughly 4 in every 1,000 births. They are formed when a single fertilized egg splits in two after conception, creating two embryos with the same genetic makeup and DNA. Scientists love to study them because they help answer the age-old question about nature vs. nurture. Because identical twins share the same genes, any differences between them — say, more wrinkled versus less wrinkled skin — must be the result of their environment. Take Laura and Linda Seber, 41, from Sheffield, Ohio. The pair tied for 8th in their high school class of 404 students, attended the same grad school — “It was great to buy one set of books,” Linda says — and now share a home while working as physical therapists. 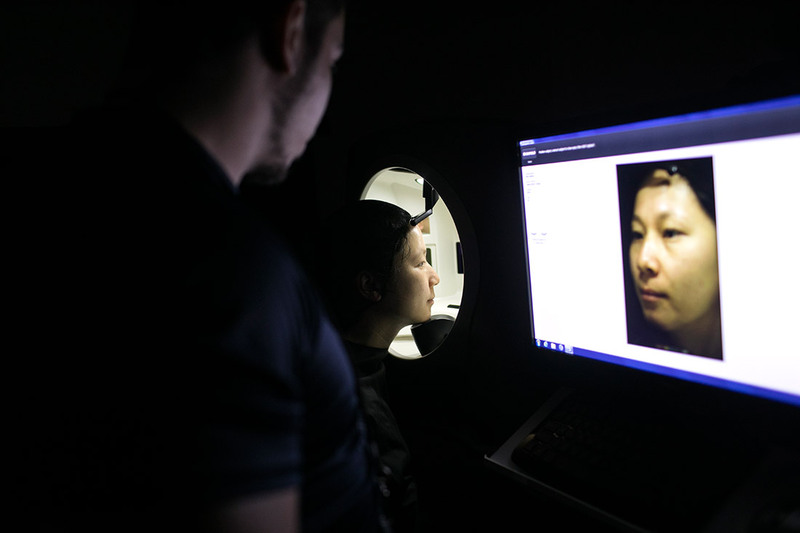 Jade Huynh participates in facial-recognition research with scientists from West Virginia University. Indeed, it is hard to underestimate the mysterious psychic forces that bind one twin to another. 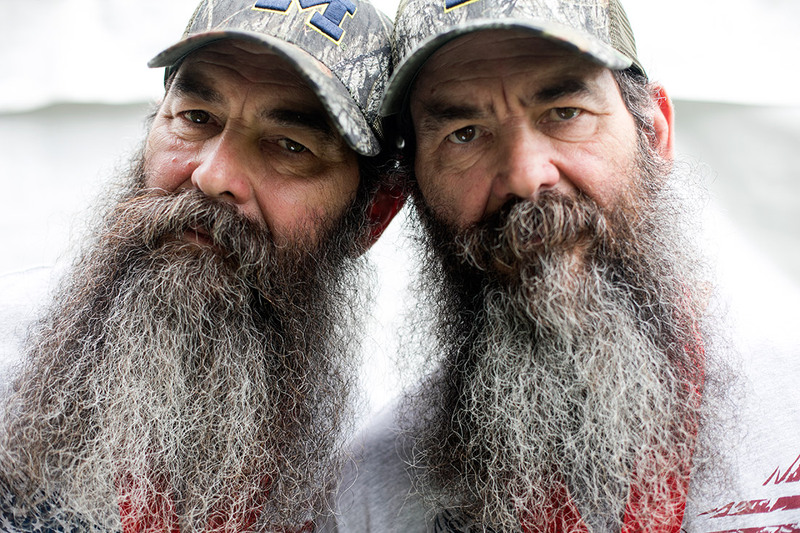 Don and Dave Wolf, 59, have identical graying beards that hang halfway down their chests. The identical twins live in Fenton, Michigan, and do long-haul trucking, sharing turns at the wheel during marathon cross-country drives. The pair recall waking up one morning as boys, age 11 or 12, to discover they had just had the same dream. A few years later, Dave suddenly became overwhelmed with concern for his brother only to learn from their dad that Dave had just broken his collarbone in a motorbike crash. Don and Dave Wolf, 59, share a home in Michigan and drive a tractor-trailer together. In a long white tent on the festival grounds, a long row of twins sit at tables before trays of color-coded food flavors: milk, potato chips, artificial sweeteners. 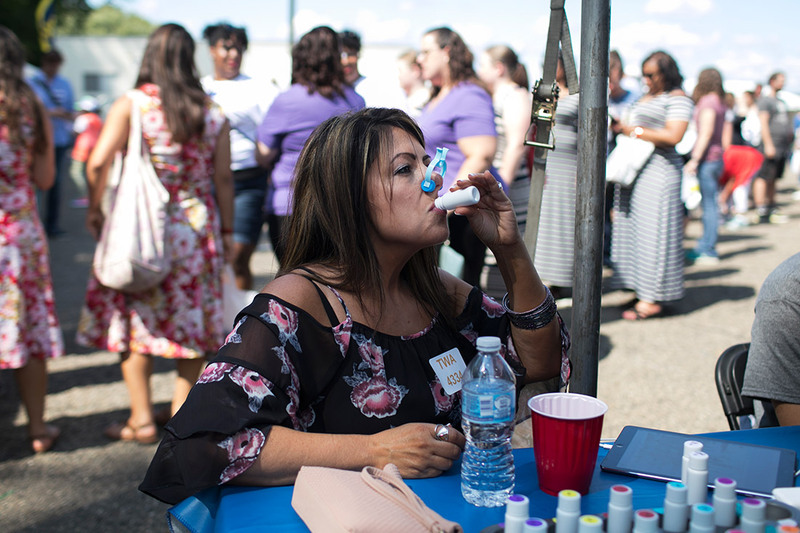 Wearing nose clips to mask aromas, they uncap each sample, take a taste and then spit into a plastic cup before taking a swig of water and tasting the next. They record their opinions on an iPad. These twins are serving as volunteer subjects for the Monell Chemical Senses Center, a nonprofit research institute in Philadelphia whose sponsors include such food giants as Coca-Cola and General Mills. This can help food scientists understand which traits — say, an affinity for bitter flavors — are most strongly determined by genetics. Tara Louis tastes different types of milk as part of genetic research into food preferences. Monell is just one of a handful of research groups that attend Twins Days. A few feet away at Procter & Gamble’s Olay tent, scientists are studying twins to better understand the aging process and its effect on skin. Nearby, a forensics expert from the Los Angeles Police Department is collecting latent fingerprints from identical twins — yes, twins’ prints are slightly different — to improve fingerprint-identification tools. And at West Virginia University’s tent, biometric researchers take hi-res photos of twins and record them speaking to help computer scientists create better facial and voice recognition systems. The FBI has funded similar research here as well. Patrick M. Ketter and Paul R. Ketter Jr. sport patriotic outfits. One twin is liberal, the other more conservative. Twins Days is also about the science of attraction. New kings and queens are crowned here each summer. But the closest thing to perennial festival royalty are the Malms. 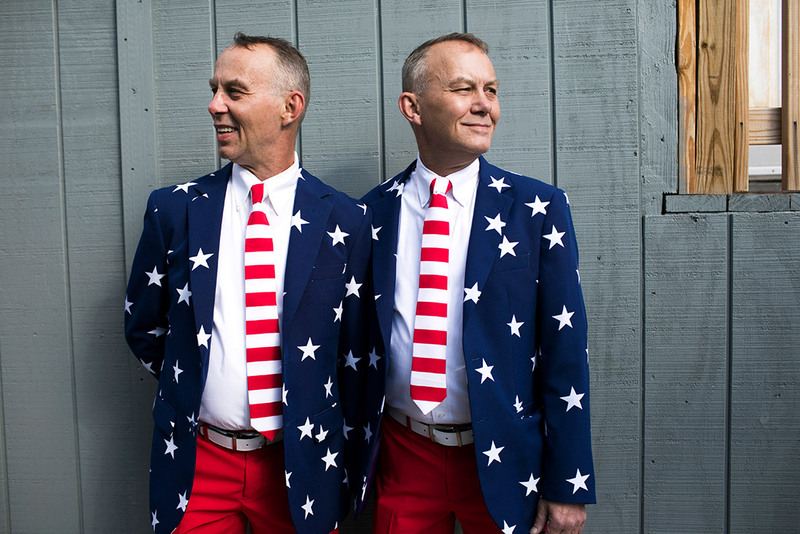 Gregarious identical twins Doug and Phil Malm grew up in Idaho. Identical twins Jill and Jenna Lassen, both introverts, grew up in Michigan. Their father would address them as “sisters” because he was too proud to admit he couldn’t tell the girls apart. All four were visiting the Twinsburg festival in 1991 when they met and sparks flew. Luckily, there was never a question over who would be with who. Phil, Jenna, Jill and Doug Malm. The foursome met at Twins Days in 1991 and were married here two years later. The foursome now live in Moscow, Idaho, as members of a tiny subset — identical twins married to identical twins. Doug and Phil, 60, are retired carpenters, while Jill and Jenna, 50, work in day care. All four share one home. Separate houses, even side by side, wasn’t an option. “It never would have worked,” Doug says. But the couples have had to learn to solve domestic disputes as a foursome. “When we fight, we can’t work it out as just two of us. We have to work it out as four,” Phil says. And yes, sometimes household confusion reigns. “When I look at my wife and her sister, there are days when I cannot tell them apart,” Doug says. Lauren and Allison Knight wear matching tops celebrating their Canadian heritage. Back at the research tents, the twins line up, sometimes for an hour or more, to participate. It’s a mutually beneficial arrangement. The twins enjoy it because they get money or free samples. Many say they feel good knowing they are contributing to science. The scientists like it because it’s an efficient way to gather data from a hard-to-find group of people. The Monell Chemical Senses Center expects to collect research on some 450 twins over the course of the weekend. “We collect a year’s worth of data in four hours,” Reed says. Braeden and Aaron Chulskiy, 2 1/2, are pulled in a wagon by their dad. Amid the procession of coupled siblings, one man wanders alone. 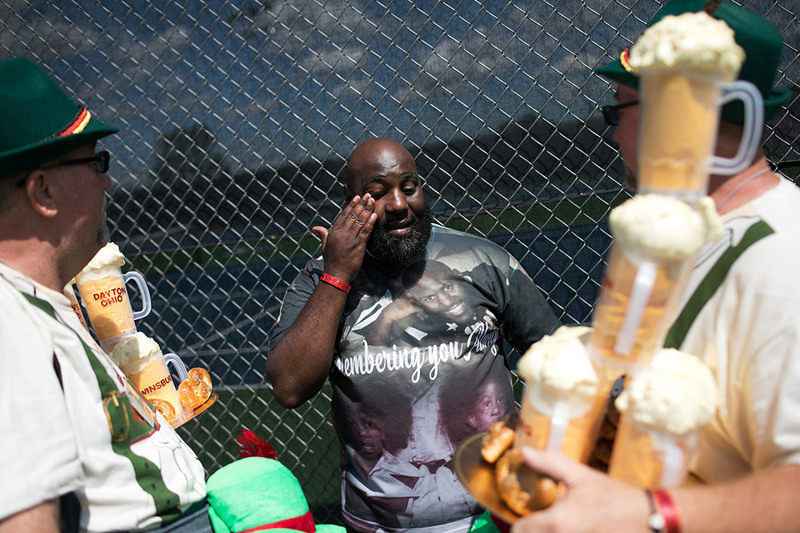 Shawn Riggins, 45, wears a T-shirt with images of his twin brother Shane’s face and a festival badge bearing both their names. And he wears his heart on his sleeve. Shane is not here. He died last September of colorectal cancer. “There’s a sense of emptiness that no words can describe,” Shawn says. “There is a pain that’s so deep you can’t cry it out. You can’t scream it out. You just need to walk through. The two brothers had been coming to Twins Days together for 20 years. They thought they were fraternal twins until 2002, when they took DNA tests at the festival and learned they were identical. Shawn Riggins, center, talks with friends at his first Twins Days without his twin brother Shane, who died last year. Shawn agonized for months about whether to come to Twins Days this year. But in the end, he decided the support of his fellow twins, many of whom knew Shane, made it worth the trip. “I came back here because no one else but a twin can understand the enormity of what I’m feeling,” he says. The scientists, focused on sets of twins, no longer want to study Shawn. They can measure twins’ DNA, but they can’t fathom the depths of their grief. But twins here, many of whom remember his brother, take him in their arms for tearful embraces. Just then, as if on cue, a woman approaches Shawn and gives him a long hug. He thanks her. Riggins takes a deep breath, pulls himself together and shuffles toward a passing throng of festivalgoers. He’s ready for more hugs, two at a time. Maddie McGarvey is a photographer based in Columbus, Ohio. Follow her on Instagram and Twitter.